I am getting ready to take the CPC exam. I have a study guide and have been practicing with the practice exams I bought from AAPC. I have heard some say the test is way different and harder than those practice tests and I am curious how many have opinions on this? Also, I am really stressing about the time factor in the test! So much that I am scared to get my morning coffee before I go because I don't want to waste time having to use the restroom. Does anyone have any suggestions on what to bring with me to the test for a snack, or if I should just forget it and eat when I am done? Any tips would be greatly appreciated! I am getting very nervous! Take grapes, raisons, String cheese and water. That is the review guide I have been using! Thanks for the suggestions! I took the test in June, but I didn't pass it, I'm scheduled for a retake in Sept. I did have my morning coffee and had to waste time going to the bathroom, I also noticed that I took too much time reading reports, I should have looked thru test first to do the quick questions, then back to reports. You have to know your terminology and abbreviations, some of the language used was not familiar to me for what I learned at Everest College. I missed by 6 points, I think I might have passed but I ran out of time and just started filling in bubbles in the mid section of test, since this is where I ended up on. I started with reports, and after 3/4 of the time was used up I decided to go to back of test, which was more easy, then went back to reports and ended up at Path/Rad, this is what I scored only 10% on very low. There is no breaks, but they added an extra 10min to class to help with bathroom breaks if needed. I didn't have time to snack, and actually time went fast. It didn't seem like 5hrs and 40min! If you're a fast reader and did good coding, and know your terminology you should do well, I have the practice test also, to me it's harder than real exam. for one you can't mark key words, and cross out wrong answers, it's also much longer than 150 questions. We had 1 person to finish test in 4 hrs, I knew her, but she didn't pass, she missed by 1 point. I saw another finish after the 5hrs and she passed with a 74, so it's up to you. I think you'll do well! pray for me and I'll pray for you!! Know your terminology, to allow more time for the long questions you will need to be able to whip through other sections, for me as a nurse, it was this section that I got through quickly. I used sticky notes to flag my books - for example I had a sticky flag labeled "hand bones" on the page which showed all of the hand bones labeled etc. I did this for every system etc. When coding for surgical procedures: Look at the answers, if you see an add on code listed with a modifier 51, you know that entire answer is completely incorrect, cross it out. I found that at least two out of four answers could be eliminated this way before even reading the question, know where to look in your book to find a listing of add on codes, also look for invalid code modifier combinations as an automatic rule out. Then read the question and select your answer from the remaining options. Remember, add on codes can never be billed alone etc. For coding guidelines for ICD-9 such as burns, sepsis etc. Look at the front of your ICD-9 book and highlight /tab the parts which tell you the correct sequencing of diagnosis codes, things such as burns, sepsis, maternal complications, HIV, Chemo etc. Also, Flag the poisoning, adverse reaction, hypertension etc. tables. flag the drug tables in your hcpcs books. Unless the rules have changed, you are given breaks and the time you take for breaks is added to the end of you test. They do need to be kept short but if you have to take a breather or use the ladies room - do so!!!! I found it really helpful to walk away for 5 minutes. I do not know of anyone who can concentrate when they have to pee! If you know your terminology, anatomy you will do fine in those sections. The reports do take time. Do not be fooled, the short reports can be the hardest! You are given 5 hrs 40 minutes from start to finish and that includes breaks if you take them or not. I took a break one time for about 2 minutes, you can only hope that the bathrooms are close to the exam room. They also only allow one person at a time to leave the exam room. Thanks for the tips! So we are allowed to have post its in the books to mark sections? If so, that would definitely help! 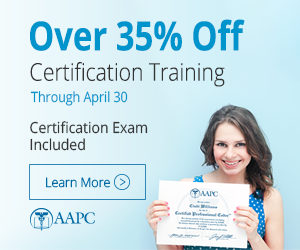 Did you do any of the practice exams the AAPC offers? I have done them, but some people have said they felt the test was way harder and nothing like the practice tests! That gives me some anxiety! Dang! I think I would be so mad if I only missed by one! I will pray for you too! Fingers crossed! I have two weeks left to study and then we will see! Ahhhh! Thanks for the tips ladies! It will definitely help!